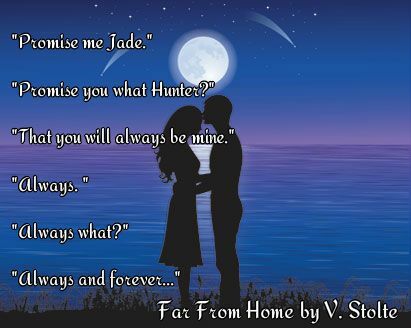 Marrying her High School sweetheart Jade thinks things cant get any better she has finally found someone stable in her life and cannot wait to live the rest of her life as Mrs. Hunter Hayes. Little does she know that happy ever after is about to change and it just seems to keep getting worse. Fearing for her life and with the help of a good friend she manages to escape the hell that has been her life for too long.. But to what? Together they find themselves connecting and after some extreme circumstances we find ourselves wondering will they be able to find their ways together or will they end in disaster? V. Stolte has lived in the Midwest her whole life. She is a stay at home mother of four and has always enjoyed reading and writing. When she is not chasing the kids or the furbabies she also enjoys photography, outdoor stuff, and maybe a bit of reality T.V. but don't hold that against her. 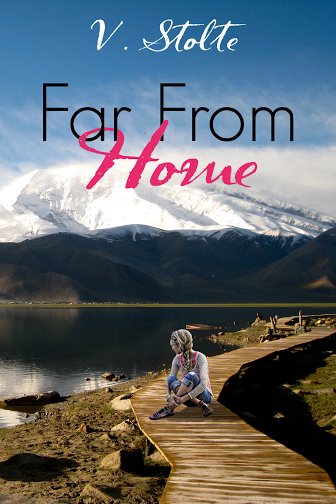 Far From Home is her debut Novella, and she hopes to be able to bring more to you in the future. You can find her here on FaceBook and stay up to date.